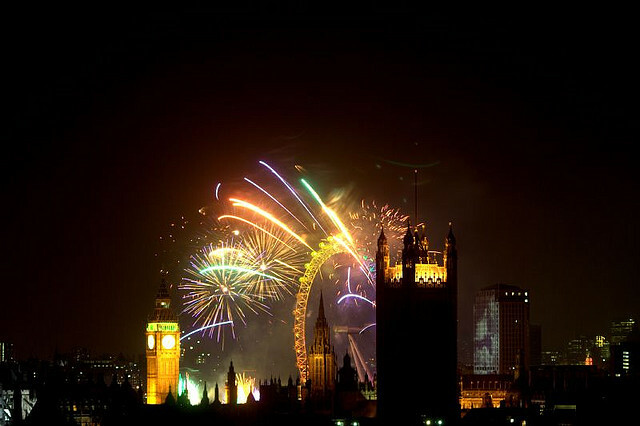 London has become a hot New Years Eve destination for tourists looking to end their December holiday off with a bang. Known for hosting a spectacular fireworks display that can be best-viewed from the famous Thames waterway, the City of London is also home to a matrix of parties on just about every street corner. Or if you’re looking for something a little more exclusive, there are plenty of urban soirees thrown at the best clubs, pubs and sophisticated dining venues London has to offer. Still need convincing? Thames Cruise: Spending New Years in London isn’t quite the same without sailing down the Thames on a party boat with gorgeous fireworks in the background. A charming way to end 2012 and a fantastic way to begin 2013, floating down the river with a fully stocked bar comes highly recommended by all who have rung in the new year in this delightful manner. Fireworks: This word crops up often when talking about spending New Years in London. The capital is renowned for putting on a life-changing fireworks display, an exhibit that has been crowned the countdown highlight of the decade by all who have chanced to see it. Keep the London Eye in sight as clock nears the midnight mark, or head to the city’s South Bank to view the full ten minutes of crackles and sparkles that will set your eyes ablaze. Clubs and Bars: If you’re not that interested in fireworks and rivers, head to London’s choicest nightclubs to indulge in some of the city’s most decadent after-sunset activities. Dance your heart out at the Ministry of Sound or have a swimming fiesta at Club Aquarium. Promising an unforgettable New Years Eve in the heart of London, there are plenty of options for the avid party rocker. To avoid any dampeners on your evening out on the town, remember to use public transport and book in advance so you can avoid surplus entrance fee charges. Don’t miss this opportunity to plan ahead and spend your New Years partying it up in London. Whether you’re rocking out on a Thames party boat, catching the London Eye to the stars, or sipping on Champagne at one of London’s exclusive New Years Eve celebrations, you’ll be surrounded by the best entertainment Europe has on hand at one of the most exciting times of year. Bella Gray is a lifestyle blogger who has built a career on travelling to foreign destinations. A travel guide for tourists looking to go abroad, Gray highly recommends travelling to London this New Years for the latest and greatest boat parties on the Thames.